This Is Important, You Should Know About It of the Day: President Obama today quietly signed into law the National Defense Authorization Act for Fiscal Year 2012, which contains controversial provisions requiring military custody for any non-citizen suspected of terrorism and affirming the president’s authority to indefinitely detain any supporter of al-Qaeda “or associated forces, irrespective of citizenship. In a signing statement, the President said he had “serious reservations” about the bill, and criticised lawmakers for interfering with the work of counterterrorism professionals. “Moving forward, my administration will interpret and implement the provisions described below in a manner that best preserves the flexibility on which our safety depends and upholds the values on which this country was founded,” the statement said. The Obama administration was successful in striking down a provision that would have removed the ability of the executive branch to override the military custody requirement. Additionally, US citizens and legal immigrants may not be subjected to military custody under the revised bill. 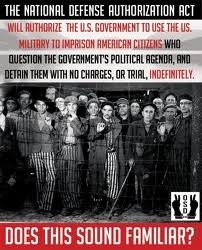 However, an amendment to explicitly exclude American citizens and lawful residents from indefinite detention was rejected by Congress. The President’s personal stance aside, in addition to creating myriad difficulties for counterterrorism agents working with suspected terrorists to gain information, the NDAA provisions leave the door wide open for future presidents to indefinitely detain American citizens without trial. A military court today decided to jail blogger Alaa Abd El Fattah for another 15 days, 15 days after first detaining him, pending investigations on what defenders say are trumped up charges. Blogger Maikel Nabil Sanad's trial was also once again postponed until November 27. Abd El Fattah was detained on October 30, after refusing to be interrogated by the Military Prosecution, in protest against its legitimacy. His arrest, and the international outcry it has caused, is shedding light on the plight of more than 12,000 civilians, including Sanad, who have been put on military trials in Egypt since the the Supreme Council of the Armed Forces (SCAF) took power. Abd El Fattah is accused of inciting violence against the military, stealing a weapon and destroying military equipment during the October 9 Maspero massacre, in which 25 Egyptians, mostly Copts, were killed in clashes between the military poilce and protesters demanding answers for the burning of churches in Sohag and Aswan. 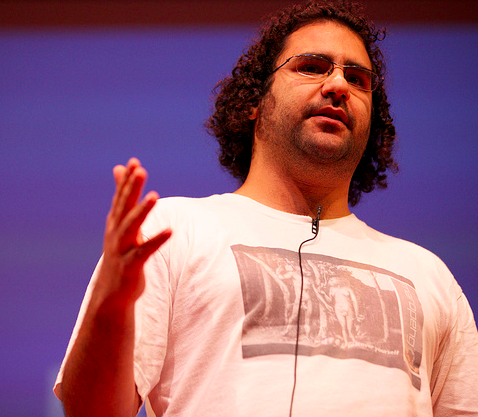 Abd El Fattah's trial coincided with Sanad's - Egypt's first blogger to be arrested and charged by a military court after the revolution which ousted Hosni Mubarak as president. Sanad was sentenced to three years in prison, for writing a post on his blog, which the military said was insulting. At first, news emerged that the Military Prosecutor dropped one of the charges from Abd El Fattah's accusations - that of stealing a weapon. 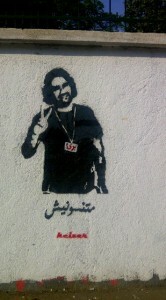 @SultanAlQassemi: Egypt Military Prosecutor: @Alaa's charge of “stealing army weapons” remains. Judge “forgot” to turn the charge sheet. Bloggers and freedom of speech and human rights defenders are holding their breath as Egypt's military courts decide the fate of two bloggers today. Maikel Nabil Sanad's trial continues today. Also, a military court judge will decide whether Alaa Abd El Fattah will be released or will spend another 15 days behind bars, pending investigations on what defenders say are trumped up charges. @leloveluck: Important day for freedom of speech in #Egypt: #MaikelNabil court ruling and #Alaa Abdelfattah investigation both taking place. Both Sanad and Abd El Fattah refuse to acknowledge the military court trying them. Sanad was arrested days after Hosni Mubarak stepped down as the president of Egypt, and was sentenced in April to three years in prison for posts he published on his blog. Back in prison, Sanad continued with his hunger strike and his defiance to accept being subjected to the trial of a military court, a stance similar to Abd El Fattah, who was detained on October 30, after refusing to be interrogated by the Military Prosecutor, in protest against its legitimacy. Abd El Fattah is accused of inciting violence against the military, overtaking armed forces weapons and damaging military equipment. Since January 28, more than 12,000 civilians have been put on military trials in Egypt. Reporter ohne Grenzen hat heute eine Petition gestartet, die unsere Unterstützung benötigt. In Ägypten werden Blogger und Dissidenten weiterhin verfolgt und inhaftiert, weil sie berichten und ihre Meinung äußern.Die Petition von ROG fordert die Einstellung der Verfolgung von Internetdissidenten sowie die umgehende und bedingungslose Freilassung der ägyptischen Blogger Maikel Nabil Sanad und Alaa Abdel Fattah. www.democracynow.org - A pair of Egyptian police officers were sentenced Wednesday to eight years in prison for the beating death of 28 year-old man. 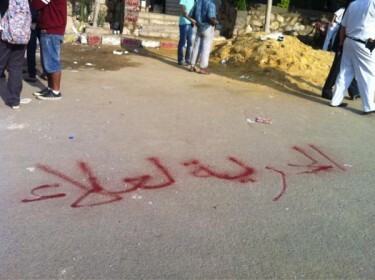 The 2010 killing of Khaled Said helped to spark the Egyptian revolution that ultimately toppled the regime of Hosni Mubarak. The officers were both charged with manslaughter. Members of Said's family and pro-democracy protesters argued the sentence was too light. 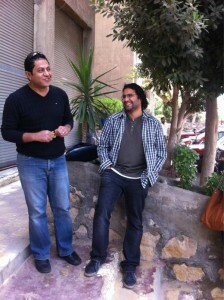 Two Egyptian youth leaders, Ahmed Maher and Basem Fathy, are interviewed on Democracy Now! about Egypt after the fall of Mubarak, as well as the growing protests they have witnessed n the United States. "Regarding the Occupy movement ... we are — in the April 6th Movement and the activists in Egypt — standing for very clear values: social justice and democracy, and justice in general," says Fathy. "We're going to support this everywhere, and let's say frankly, that we're happy for finding the people trying to correct the bad way of democracy, even in the United States."